The Permanent Makeup Training Academy was named winner of the Outstanding Education Service Award at the 2015 Global Business Excellence Awards. The Global Business Excellence Awards are one of the world’s highest profile awards and winning this accolade speaks volumes about the quality of your work. Due to their high profile, the Awards attract a wide range of entries from across the world, from large international PLCs and public sector organisations to dynamic and innovative SMEs. The winners all have one thing in common – they are truly outstanding at what they do and The Permanent Makeup Training Academy have proved this by winning a Global Business Excellence Award. “To be honest I was quite taken back when it was announced that I had won a ‘Global Business Excellence Award’ for Outstanding Educational Service. To be up there as a winner with other such amazing companies on a Global scale was a huge honor. I sometimes still have to pinch myself when I see so many people travelling thousands and thousands of miles across the world having personally chose to come and train with me at my training center in Sussex. 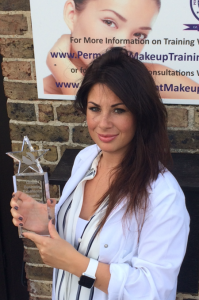 This award is Katy’s/The Permanent Makeup Training Academy’s, 7th high profile Award in the last 3 years.